We’ve mentioned this lovely news in our Just Married section. 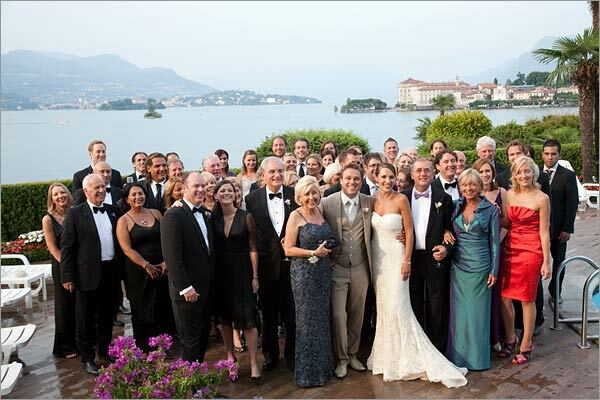 This was one of the most important event of 2010 Summer Season on Italian Lakes: Daniel and Tessa’s wedding on Lake Maggiore. Tessa Brix is a Dutch model. She is also famous in her country for many TV spots and catwalks. In 2003 she was Miss Netherlands Universe and she represented Netherlands to selections for Miss Universe in Turkey. In 2005 she was chosen again to represent the Netherlands to Miss Europe in Paris. It was a real honor for Italian Lakes Wedding Team hosting Tessa Brix wedding. We worked hard to make this happen and to let Tessa and Daniel enjoy their event in every single detail. 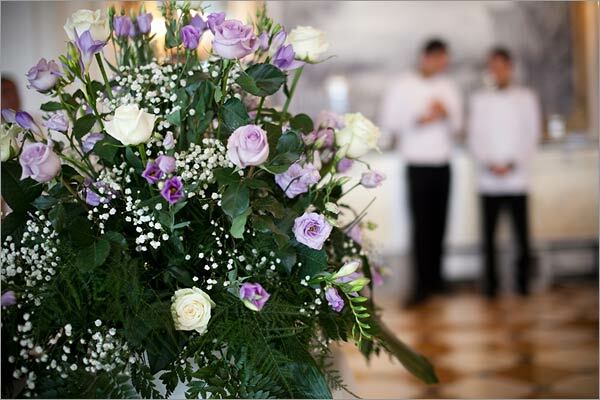 Valentina Lombardi – our planner for Lake Maggiore – followed the planning event, Monika Andenmatten followed floral design. Enrico Mocci was the photographer chosen by Tessa and Daniel to be their official photographer for their Big Day. You will see here just few images of all the pictures but do not hesitate to see Tessa and Daniel’s PHOTO GALLERY. There are more than 60 images taken by Enrico Mocci who calibrated colors, lights and shades in a perfect way. Honest, Sporty, casual and sweet : this is how Tessa describes herself in her on line biography. Her beauty, wonderful Lake Maggiore scenarios are surely the main actors in this great event. 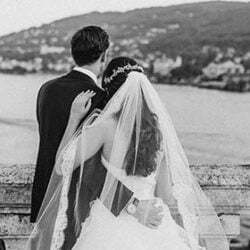 Wedding was arranged among Stresa, Pallanza and Isola Bella. Three well known destinations on Lake Maggiore. 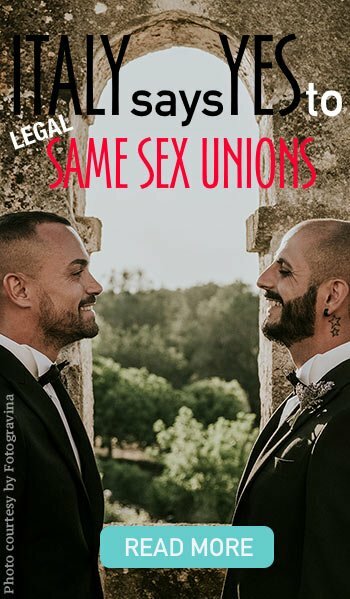 They were the perfect frame for such a great wedding. A wonderful sunny day was the final touch! Villa Palazzo Aminta was the headquarter of all the events. 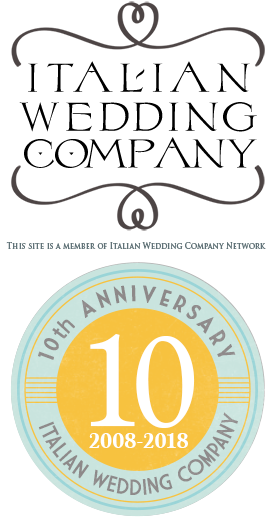 It was the place where bride and groom and their guests spent their staying in Italy. At the right time all guests took a lovely motorboat to reach Villa Rusconi Clerici. 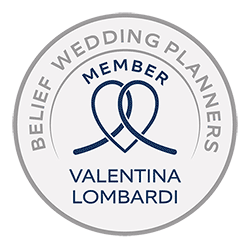 Marriage ceremony was held in the lovely lawn of Villa Rusconi on the lake shores. 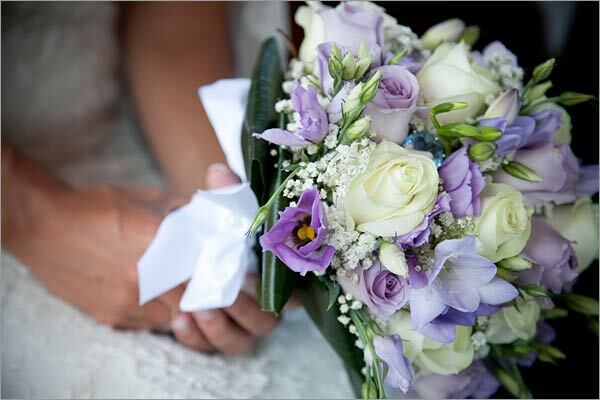 Tessa’s choice for flowers was based on Lisianthus, Freesias and Roses. 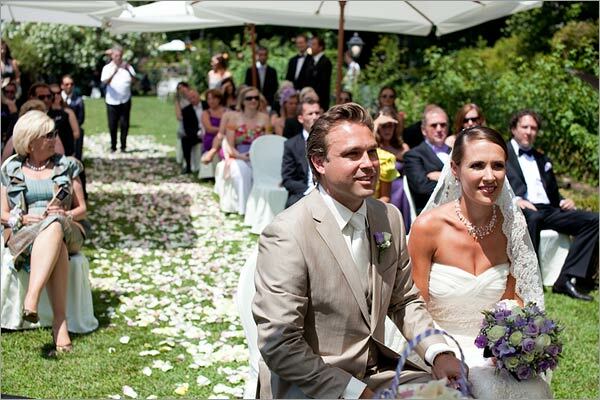 White and lilac rose petals were scattered on the aisle in the green garden of Villa Rusconi. 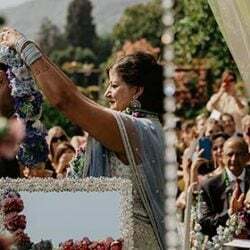 As far as the blessing was concerned Monika Andematten created two high arrangements placed side of the ceremony table. Tessa’s color scheme was based on lilac and white in different pastel shades. These fine and elegant colors were also incorporated in Tessa’s elegan bridal bouquet who matched her wedding dress just perfectly. After the ceremony Tessa and Daniel enjoyed the wonderful day with a short toast to the villa and most of all with a motorboat tour to Borromeo Islands and Isola Bella. 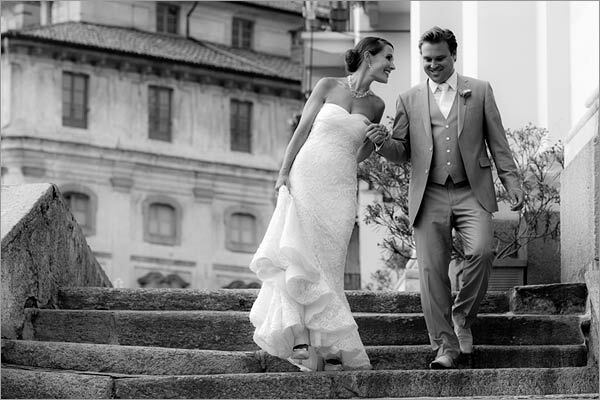 If you are looking for an amazing place for your wedding pictures Isola Bella is surely the best option. We will come back soon with more posts about this opportunity. After the pictures it was time to come back to their guests for Tessa and Daniel. They were all waiting for them to Villa Palazzo Aminta. While waiting for them they all took the opportunity to change their dresses and suits and have a little swim in the swimming pool of the hotel. Tessa and Daniel took many other pictures in the wonderful rooms of the hotel. 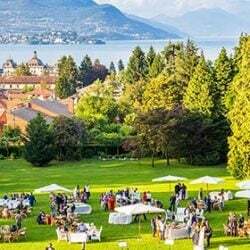 This is one of the most exclusive venues on Lake Maggiore. After a lovely aperitif in the garden and a perfect dinner in the restaurant of the hotel, some speeches and lots of kisses and moving moments it is time for the wedding cake! A delicious and beautiful wedding cake was the perfect surprise arranged by Tessa’s mother for bride and groom. Tessa and Daniel cut their cake in the garden of Villa Aminta overlooking a perfect night view on the Lake and Borromeo Island. 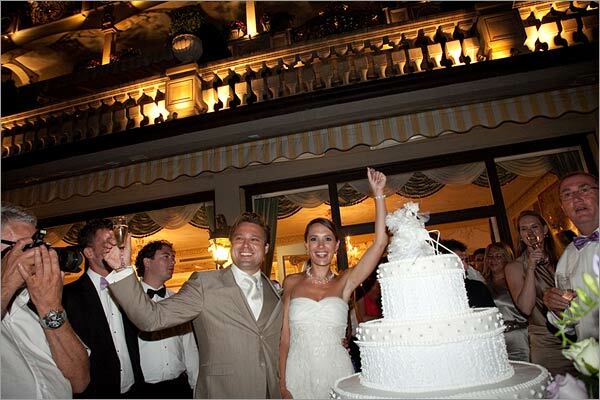 Just a magic moment for the unforgettable wedding of Miss Netherland Universe on Lake Maggiore!